PARIS (AP) — Diesel is in the doghouse. There’s a global fight over trade. Brexit is looming. Tighter vehicle emissions rules are on the way. Those are among the challenges facing auto executives as they gather this week at the Paris Motor Show to unveil new vehicles and talk about the industry’s future. A number of carmakers, including Volkswagen and Ford of Europe, are skipping the event, which alternates years with Frankfurt as Europe’s major auto exhibition. Still, the shiny new models, ranging from sleek supercars for wealthy collectors to hatchbacks for urban millennials, are a powerful draw for the public, with the last show in 2016 attracting 1.1 million people. A major focus will be the rollout of luxury electric sport-utility vehicles from the established automakers competing with Tesla’s all-electric Model X SUV. Daimler’s Mercedes-Benz has the EQC and Volkswagen’s Audi will show off the e-tron. The launches by two major luxury brands represent a notable endorsement of electric vehicles, but will they catch on with consumers? Pure electric vehicles had only 0.6 percent of the European market in 2017 and remain relatively more expensive than gasoline or diesel, which is why the focus for now is on the higher price range. And there are questions over when carmakers can match Tesla’s proprietary network of Supercharger fast-charging stations. Daimler, Audi, Porsche, BMW and Ford have formed the Ionity joint venue to build 400 fast-charging stations on highway routes across Europe by 2020. But the Ionity website shows only seven stations so far, with 12 under construction. Tesla already has 1,344 stations with multiple chargers in Europe and the Middle East, according to its website. Selling more electrics would help European automakers meet tightening limits coming in 2021 on emissions of carbon dioxide, a greenhouse gas that scientists say causes global warming. And no one wants to be left behind when battery prices fall and electrics become a real choice for cost-conscious car buyers. Diesel cars have seen a steep fall in sales in the wake of Volkswagen’s 2015 scandal in which it was caught rigging engines to cheat on emissions tests. Diesel’s market share fell from 50 percent on the eve of the scandal to 36 percent in Europe in July. Yet automakers will still be offering plenty of new diesels, especially when it comes to SUVs. They get better mileage, and fuel is expensive in Europe. In Germany, gasoline costs about $6.30 per gallon. Automakers will also need that better mileage performance to meet the European Union’s CO2 emissions standard. Diesel still faces opposition from environmentalists who want faster progress to electrics and have exerted pressure on cities with high levels of air pollution to ban older diesel models. The industry was relieved when U.S. President Donald Trump agreed to hold off on new import duties for autos. But worries about an exchange of new tariffs between the U.S. and China have nonetheless darkened the outlook. Both BMW and Daimler cited trade concerns in issuing profit warnings this year. BMW is the largest U.S. auto exporter, shipping SUVs from its plant in Spartanburg, South Carolina. Britain’s Brexit divorce from the EU threatens to undermine auto production in Europe by slowing shipments of parts between the EU and Britain. Modern auto plants operate on a strict time schedule, sending parts just in time to be put together when manufacturing an engine or chassis. Even small border delays could wreak havoc at plants on both sides of the English Channel. Jaguar Land Rover CEO Ralf Speth has said the company would have to reassess plans for 80 billion pounds ($104 billion) in investment if Britain leaves without an agreement guaranteeing tariff-free trade with the EU. Oh yes. The cars. PSA Group’s premium brand DS shows off the DS 3 Crossback, dubbed “the most important French launch at the show,” by automotive business intelligence firm JATO Dynamics. The vehicle is one size smaller than the DS 7 Crossback, which has helped revive the brand’s sales. It’s in the “B” class, just above the smallest subcompacts, and will face tough competition from the Audi Q2 and MINI Countryman. The popularity of such smaller SUVs has helped automakers increase sales as consumers shift from sedans and hatchbacks. BMW is expected to unveil a new version of its seven-year-old 3-Series, a midsize sedan that has underpinned the company’s model range for years. Cars still outsold SUVs in the premium midsize segment in Europe last year, though the gap has been shrinking as SUV sales boom. 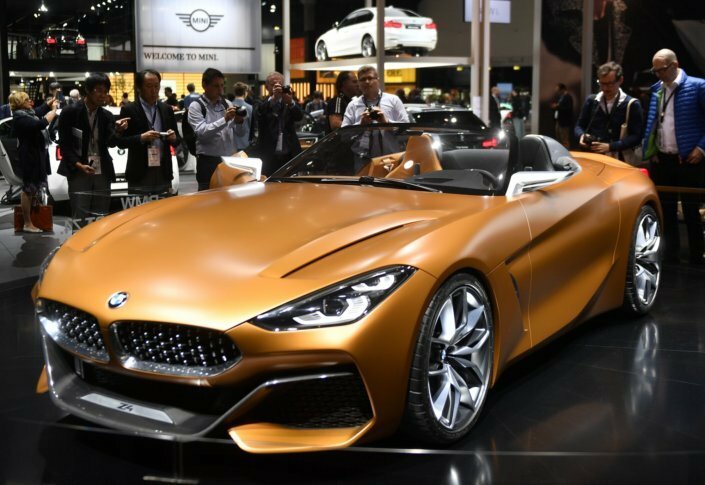 BMW will also show off the revived Z4 two-seater into a lukewarm market for premium midsize sports cars in Europe. “Sports cars are slowly disappearing from the roads, as they are being challenged by supercars on one side, and with coupe SUVs on the other,” said JATO. For sheer gawking value, it will be hard to beat the Bugatti Divo, billed as a lighter, more agile version of the company’s Chiron supercar. Gleaming in a paint job dubbed “titanium liquid silver,” it’s powerful as well as pretty, with a monster 16-cylinder engine generating 1,500 horsepower. The production run of 40 is sold out at 5 million euros ($5.8 million) apiece.